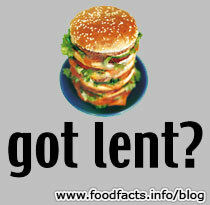 With Fat Tuesday (Mardi Gras) concluded, today is Ash Wednesday and Lent begins. At least three fast food companies had the Lenten religious tradition of eating fish (instead of meat) in mind when they issued press releases yesterday. Del Taco doesn't mention Lent either, but they've picked today to formally announce their Crispy Fish Burrito. The burrito follows the introduction of their Crispy Fish Taco, which they say has been extremely popular. The new burrito comes "with two crispy fish fillets, a new ancho chili sauce, crunchy cabbage, freshly made salsa all wrapped up in a warm flour tortilla and a lime wedge." Now Long John Silver's could have clearly simply said, "Come eat almost anything on our menu for Lent," but since (presumably) none of the big lottery winners opted to take Long John's up on their offer to be a spokesperson for their new Lobster Bites, that's what they chose to push in their press release for Lent. "Taste the good life! Long John Silver's brings buttered Langostino Lobster Bites to America just in time for Lent. Leave it to the world’s most popular quick-service seafood chain to add some excitement to the dining season during Lent." Something tells me that's not exactly what Father O'Malley had in mind when he told us about fasting and abstinence!